Trapeze is an English rock band formed in 1969 by vocalist John Jones and guitarist Terry Rowley. The band was quite popular in Europe but never made it as big as they hoped in the USA. Trapeze is famous for being the springboard for the career of Glenn Hughes. 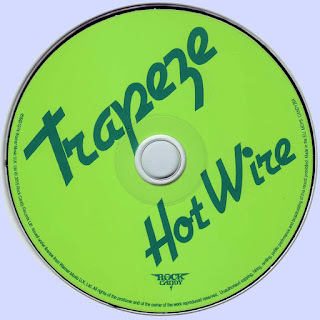 Trapeze could be described as a pre-Super group, as in addition to Hughes, the band also included Mel Galley on guitar and Dave Holland on drums. After Glenn Hughes departed in June of 1973 to join Deep Purple, Holland and Galley kept the band going with a varying line-up of members until 1979 when Holland went on to join Judas Priest. Holland tried to revive the band back in 1990 after leaving Judas Priest, but the band finally broke up in 1994. Hot Wire is the fourth studio album by the band, and the first to be recorded since the departure of Glenn Hughes. Replacing him was Pete Wright. This line-up also included second guitarist Rob Kendrick, joining Galley on vocals/guitar and Holland on drums. It was also the second album produced by Neil Slaven in 1974 for Warner Bros. Records. To be truthful, before doing this review, I had never even heard of this band, but I wish I would have. If you like good rock and roll with a little bit of funk and fun to it, then this Trapeze is for you! While best known for his guitar skills, Mel Galley does an amazing job on vocals on this album. This guy can sing... and I mean sing! Peter Wright lets his presence be known, as his bass is over-the-top on the first track on the album titled "Back Street Love," which also happens to be my favorite track on the disc. "Wake Up Shake Up" has more great vocals from Galley, but it’s the twin guitars that make this a really fun and catchy rock song. "Turn it On" and "Feel it Inside" feature guitar riffs that are just amazing. Kendrick can play as good, or better, than some of the bigger name guitar players out there. If you like some funk with your rock then "Midnight Flyer" is a track you’re going to get down and get funky with; it’s true ‘70s funk with a little bit of rock thrown in for good measure! Over-all this is a good album, it makes me want to go out and pick up their other albums to see what they are like. And if they are as good as this one.... then it’s a win-win for me… and you too! Fully Remastered Audio - 16 page full-colour booklet, 2,500 word essay, brand new interviews with Mel Galley & Pete Wright, enhanced artwork and previously unseen photos. 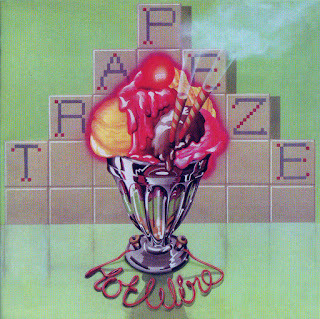 Trapeze were initially one of the most promising and, later on, revered bands to have emerged from the UK during the 1970s. They blasted their way from obscurity to international acclaim, then, just as stardom beckoned, the carpet was pulled from under their feet when in 1973 vocalist and front man Glenn Hughes opted to leave the band, hitching his wagon to hard rock grandees Deep Purple. The general consensus was that Trapeze would not be able to carry on after such a catastrophic blow yet, against all the odds, they dusted themselves down, retrenched and got back in the ring to fight another day. Choosing to expand the band's line up, founding members guitarist Mel Galley and drummer Dave Holland opted to recruit fellow Midlanders, bassist Pete Wright and second guitarist Rob Kendrick. Together they took the Trapeze blueprint of funky hard rock and injected it with a far more hook-laden sheen. Showing real growth the band's sound evolved incrementally, with Mel Galley taking on lead vocals, there were now songs that wouldn't be out of place in the esteemed company of mid-seventies US arena acts such as Derringer, Montrose and Foghat. Originally issued in 1974 and produced by veteran blues champion Neil Slaven (Savoy Brown, Chicken Shack, Stray) at Island Records Basing Street studios in London, the album contains a stellar selection of hard-hitting tracks, including 'Back Street Love', 'Wake Up, Shake Up' and the album centrepiece 'Midnight Flyer', an impressive and hard hitting funk fuelled track built to blow your mind.